Education is not a product. The University is not a factory. I’m not sure who originally came up with this interesting saying. 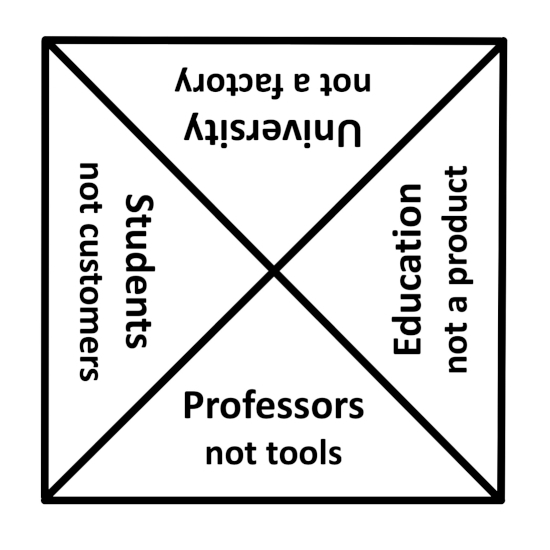 Examining the anti-analogy, you have “customers buy products made in a factory with tools”. Perhaps a better fourfold would be to change this to “workers use tools to make products in a factory”, so you could say “Students are not workers.” But then you lose the capitalistic “consumer culture” geist. Or you could say the Professors are (not) factory workers and the Students are (not) the raw material. As a homework assignment, write an essay or develop a mathematical theory comparing this anti-analogy fourfold (or a close derivative thereof) to Aristotle’s Four Causes. Please show your work. Rigor (from low to high) is said to be based on the six levels of Bloom’s Taxonomy of Thinking (knowledge, comprehension, application, analysis, synthesis, evaluation; or revised as remember, understand, apply, analyze, evaluate, create). 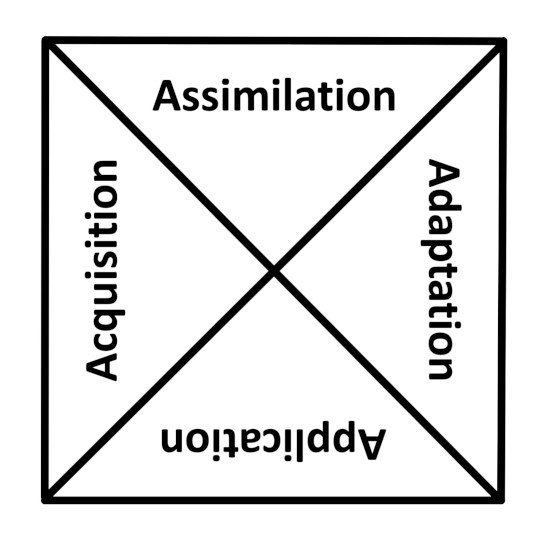 Relevance (from low to high) is said to be based on Daggett’s Application Model (knowledge in one discipline, apply in discipline, apply across disciplines, apply to real-world predictable situations, apply to real-world predictable situations). There seems to be quite a bit of information associated with this center so I’ll need to look at it some more! 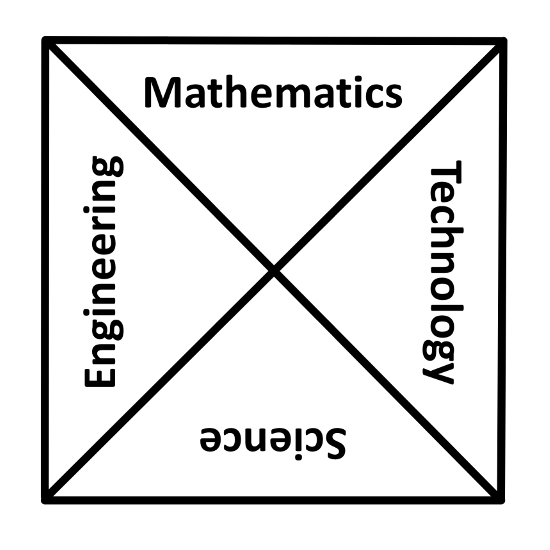 STEM: Science, Technology, Engineering, and Mathematics. We often hear that these areas of education and expertise are critical for the development of our modern society. To attract students to these fields, banners and logos are full of bright colors and crisp graphics. In comparison, above is my rather dull diagram. Not very enticing, is it? Some are now adding Arts to the four, giving STEAM. I think the Arts are important of course, but fives don’t go with my oeuvre. 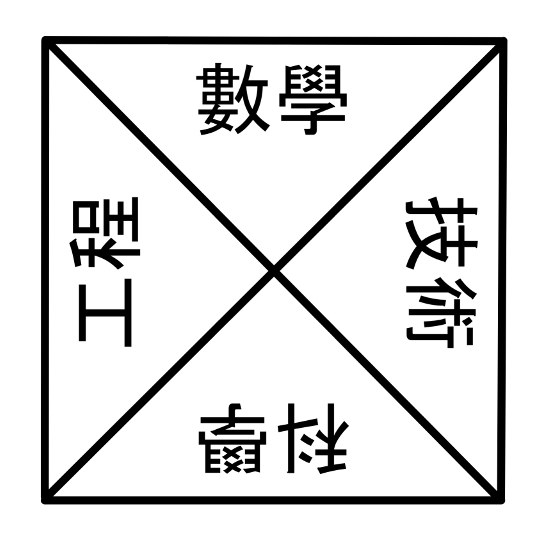 In addition, I give you a diagram with Chinese substituted for English (科學 技術 工程 數學).